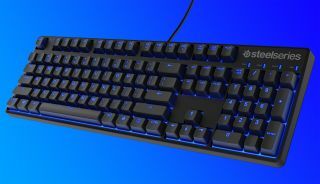 SteelSeries has revealed a new mechanical gaming keyboard which is 'tournament-ready' and aimed at eSports professionals and aspiring competitive players. The Apex M500 uses Cherry MX Red switches, meaning they're linear switches that don't click and actuate with the slightest pressure. They're also guaranteed for up to 50 million key presses – though we doubt anyone will be counting. You also get blue LED backlighting with the ability to choose between four levels of brightness, which can be adjusted for each individual key, so you can make certain letters stand out. Furthermore, there's 100% anti-ghosting tech on board, meaning that players can mash...er, sorry, we mean press as many keys as they like, and all of them will register without fail. This SteelSeries keyboard doesn't go for a particularly flashy look, and that's by design, as the company notes it wanted minimalist aesthetics and believes that keyboards shouldn't look like they came through some kind of 'portal from the future'. The no-nonsense vibe also means a solid build quality, with tough plastic used in the construction of this peripheral, and the chassis benefits from a steel backplate to help boost overall durability. On the software front, there's plenty of customisation with the user being able to reassign keys as they wish and build an unlimited number of profiles – and these profiles can be set to automatically launch when the appropriate game is fired up. Macros can be assigned as you would expect. Cable management is provided with three channels for the USB cable carved into the underside of the keyboard, so the lead can emerge from a central position, or on the left or right side of the M500 depending on your preference. The Apex M500 is out now, although at the moment it's marked as temporarily out of stock in the UK. The price is $99.99 over in the US and €119.99 in Europe (around £96, or AU$179).